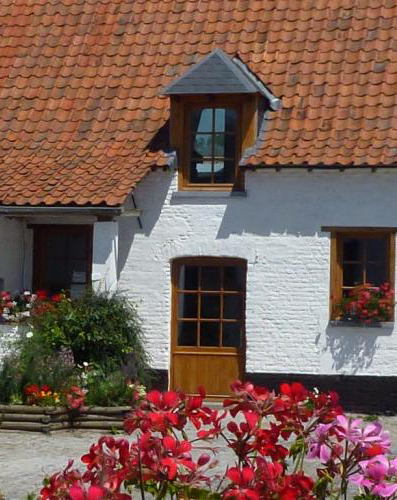 Located in Wasmes-Audemetz-Briffœil, a small countryside village, the Saint-Michel farm is mainly focused on animal breeding: limousine cattle and farmstyle poultry (broiler chickens, ducks and turkeys), as well as crop cultures. A main part of the crops is used to feed the animals raised on the farm. Built in the backyard, the modern barns do not disturb the charm of the original farm (XVIIIth century), whose buildings (house, stables, barns and dependencies) form an elegant quandragular farmyard. Among those, the ancient stable has been transformed into a peaceful guesthouse, which can host (up to) nine people. Another dependency of the old farm is now a small shop where farm products are sold every Saturday. Limousine cows calf naturally and feed themselves mainly with raw forages: grazing pastures during the summer and eating hay and silage during the winter. Our animals are fed with the great majority of crops produced in our fields and stored in our barn. Those crops are integrated to different feed ratio and fed to each types of animal. Our farm is located in Wasmes-Audemez-Briffœil (Hainaut, Belgium).The easiest way to get there is the highway E42 going from Lille (France) to Liège (Belgium), passing through belgian cities of Tournai, Mons, Charleroi and Namur. Leaving the highway at exit 30, you will easily find the farm following the map here below. Copyright © 2016 All rights reserved. Powered by WordPress. Original theme by Arinio . Adaptation by Pierre Faux.